What do best-in-class status updates look like? 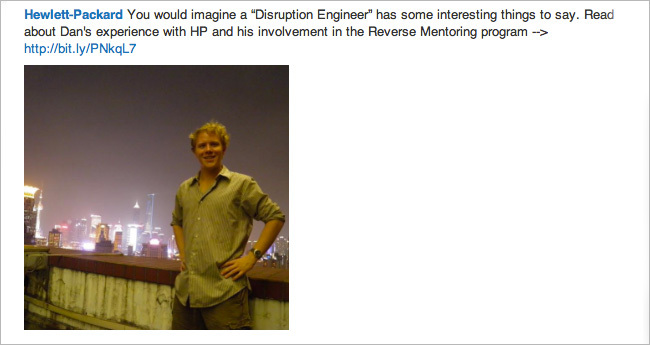 I’ve been following HP on LinkedIn for some time now. The company’s posts have made me think, click, share, and even laugh. Let’s take a look at HP’s activity during May 2014. What stands out? Frequent posts, several times per day. 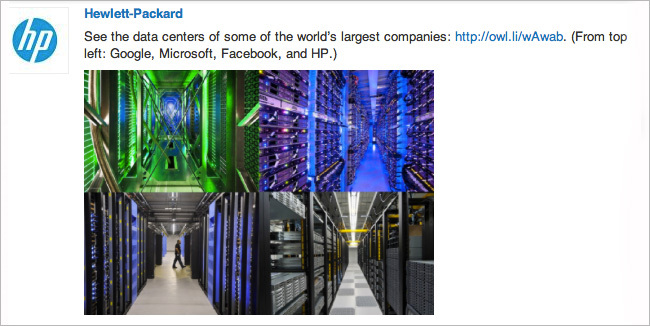 HP posted 76 times in May, averaging three posts per business day. They typically posted twice on Sundays and took Saturday off. 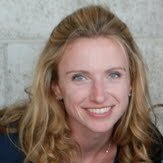 Articles from other sources. 42% of HP’s May content came from external sources. The company pulled from a wide range of outlets: from international news organizations such as Time, to industry publications such as Computerworld, to blogs on platforms such as Dice and LinkedIn. A great balance of content, with talent branding a key component. Here’s the breakdown of the 76 posts by content type. 1. Thought leadership, news, and professional inspiration accounted for almost half (47%) of HP’s May updates. Putting its footprint on curated content, literally. 2. Talent branding accounted for about one-fifth (21%) of HP’s May updates. 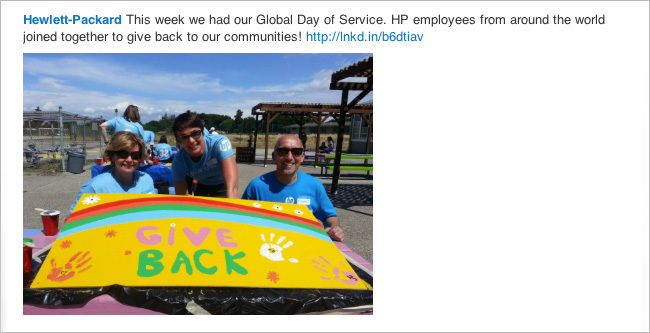 While technically all of HP’s updates support its talent brand, these posts are specifically about HP as a great place to work. 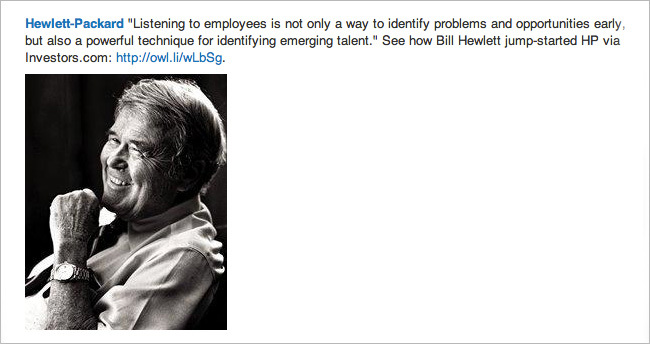 Clearly Marketing and Talent Acquisition are talking to each other! Engaging both employees and new graduates with inspirational advice. 3. Product announcements, promotions, and news accounted for 16% of HP’s posts in May. Here’s HP including useful statistics as part of its product education. 4. 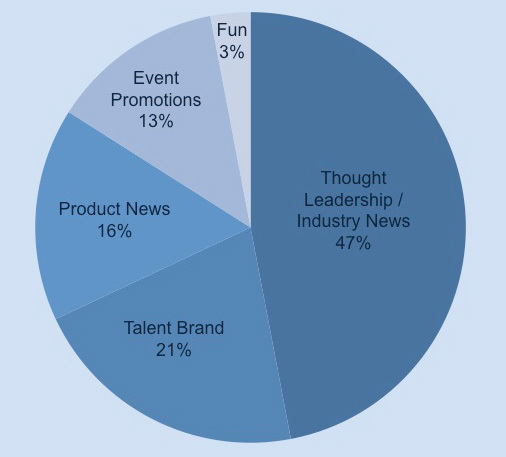 Event promotions accounted for 13% of HP’s May activity. HP Discover, the company’s annual showcase technology event, is taking place in June, so naturally most event updates focused on it. 5. 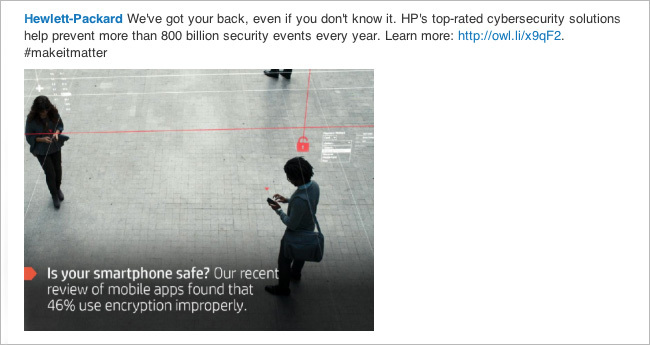 “Fun” posts accounted for 3% of HP’s updates in May. 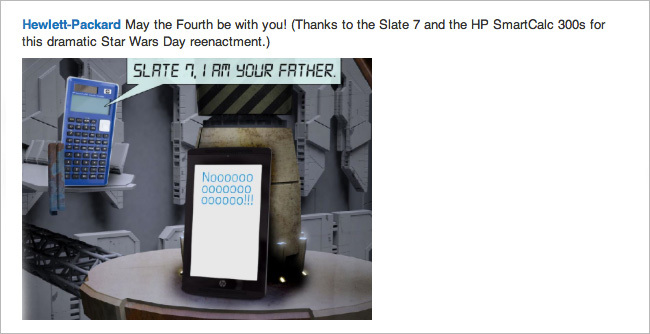 Here’s HP showing its wit and sense of humor with this light-hearted post on May 4th. Need more inspiration? Here is HP’s full month of status updates, in chronological order. This is one company’s recipe for success. What’s yours? 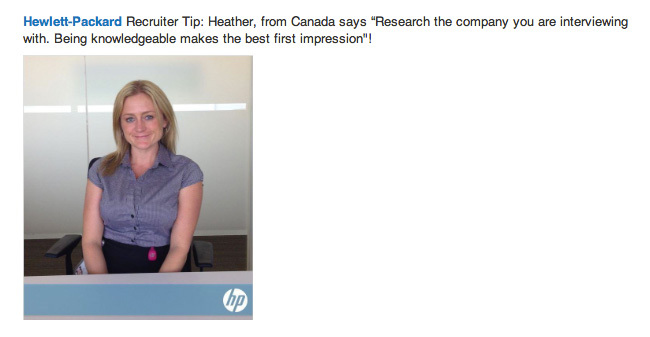 Let us know at @HireOnLinkedIn. *Note: I’m a marketing professional in North America, so my feed may be different from say, an engineer’s in India.